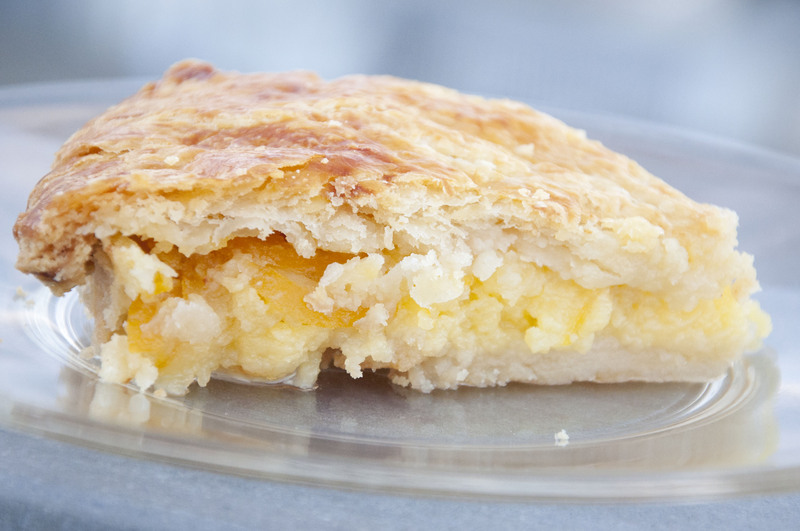 The filling for this pie is extraordinarily simple: whole lemons, eggs, and sugar. 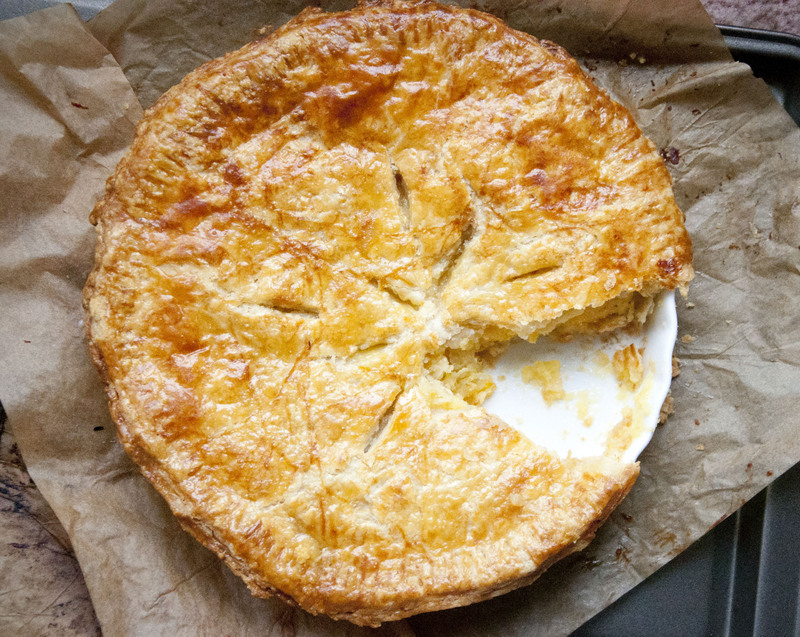 The entire process is quite time consuming for a pie that’s so simple. 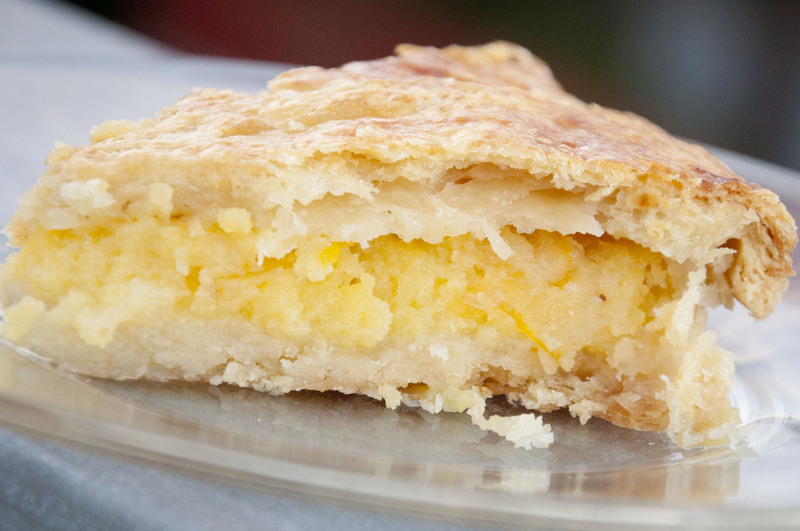 The final result is worth it if you love lemons—an intensely rich lemon filling encased by a flaky and very buttery crust. Note: I used 2/3 of this recipe because my tart pan was shallower. The full recipe is below. a. Slice lemons paper-thin and discard stem end and seeds. b. Toss with sugar in a glass or stainless steel bowl. c. Let sit for 3 hours or overnight. (This step, which tenderizes the skins, can be omitted with Meyer lemons, but I let the lemons macerate anyways). Chilling or freezing the lemons will make it easier to slice them thinly. a. Dissolve salt in water. b. Place the flour in a mixing bowl. Add chunks of butter. Using a 2 knives, cut the butter into the flour until the mixture forms large crumbs. (Alternately, use a food processor to accomplish this). c. Drizzle in the water until a shaggy mass. Toss dough with a fork if doing by hand, or simply drizzle water into the food processor. d. Divide dough into 2 equal balls and shape each into a disk 1 inch thick. Wrap in plastic and chill for 2 hours. (I divided the dough into 3 balls and used 2 of them for this tart). a. Place one disk of dough on a floured surface or between 2 sheets of parchment paper. b. Roll out to 1/8 thick, rolling from the center toward the edge. 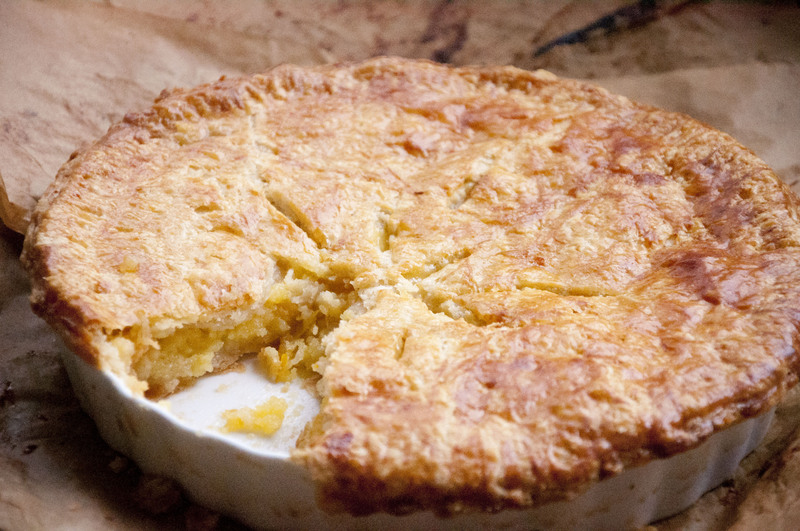 The final circle of dough should extend about 1 ½ inches beyond the edge of the pan if lining a tart dish. Repeat for the other disk of dough. c. Carefully transfer 1 piece of dough to the tart dish and press into place. In this case, a 1 inch overhang should remain. Set aside. a. Whisk together eggs and salt together. b. Add eggs to lemon mixture. c. Pour the mixture into the lined tart pan. Evenly distribute the lemon pieces in the pan. a. Whisk together the egg yolk and cream. (I omitted the cream since I didn’t have any, and it turned out fine). a. Brush the rim of the pastry overhang with egg. b. Lay the second piece of dough over the filling. c. Trim the overhang for both rounds to ¼ inch. Crimp the edge and make a good seal (a fork is useful for this). d. Brush the top crust with egg yolk. f. Chill pie for 30 minutes. a. Preheat oven to 350F. b. Line baking sheet with aluminum foil. Place pie pan on top of this sheet (this will make clean up easier should any filling bubble over). d. Bake about 40 minutes, or until the top crust is a deep golden grown and the filling is bubbling. If the top cooks too quickly, cover with a piece of foil. e. Let cool before slicing. This lovely tart is super simple to make. Unlike other tarts, it’s not too sweet or heavy. There’s an apple glaze made out of the peels and cores, which I didn’t find to be quite necessary, since the tart alone was delicious enough. 2. To prepare dough: combine the flour, sugar, and salt. 3. Cut in the butter with two knives (this actually works!) or with your fingers, until the mixture resembles coarse crumbs and the largest pieces appear to be large peas. 4. Dribble in water until dough. Keep working the dough until it forms a ball, and flatten into a disk. 6. Roll dough into a circle about 14 inches in diameter. (Roll between two sheets of plastic wrap or parchment paper for easy cleanup, or use a lightly floured surface). 8. 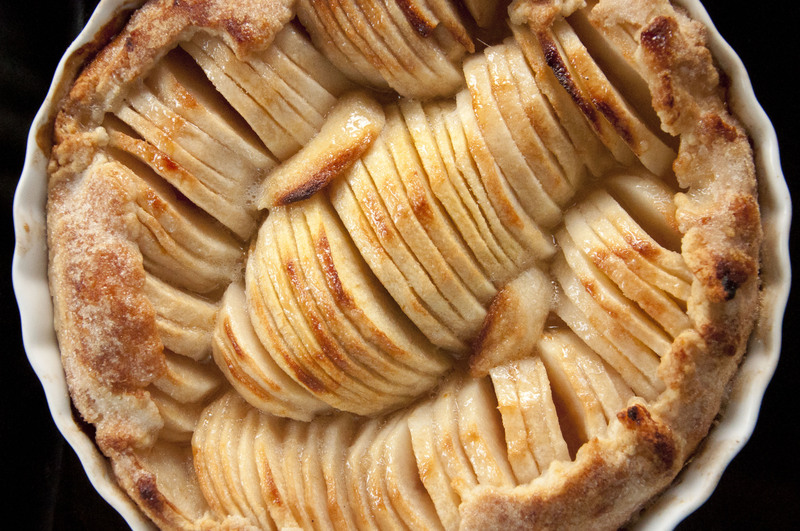 To prepare filling: Overlap apples in the tart pan in a ring starting from the outside edge and move toward the center. 9. 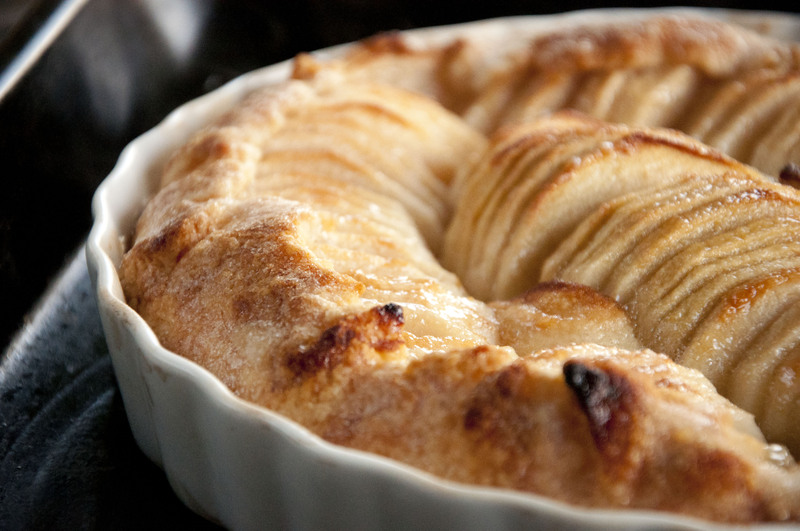 Fold any overhanging dough over the fruit and crimp at 1 inch intervals. 10. Brush the 2 tbsp melted butter over the apples and onto the dough. 11. Sprinkle 2 tbsp of the sugar over the dough and about 3 tbsp over the apples. You can use less if desired for a less sweet tart. 12. 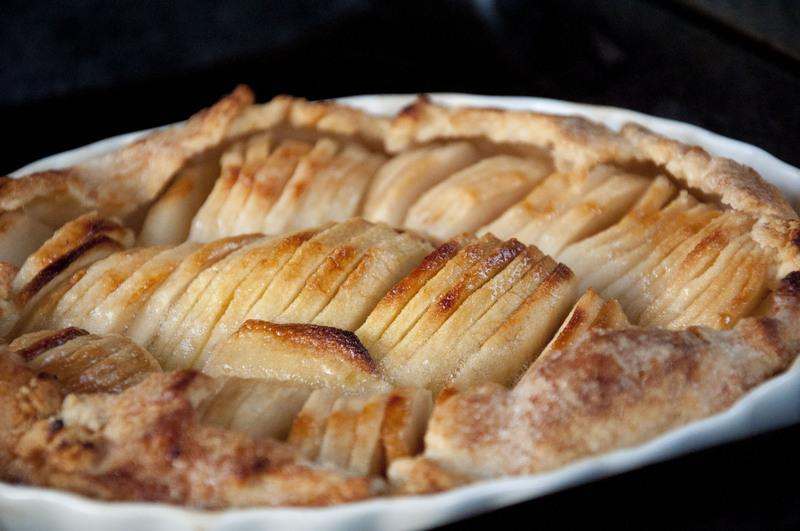 Bake for about 30-45 minutes, or until apples are soft with browned edges, and crust has caramelized. 13. To make glaze: Put peels and cores in a saucepan with sugar. Pour in just enough water to cover and simmer for 25 minutes. Strain syrup and brush over cooled tart. 14. Let tart cool before serving. Enjoy!